To Enjoy God | God loves us and wants us to be happy! Who would say this kind of thing? Who would say it over and over again? We find it repulsive and react to the statement with revulsion. Some mad man or raving lunatic must be be spouting off. Best just to ignore him and get far, far away. Jesus said these words to a bunch of Jews who were chasing him all over Galilee. He had miraculously multiplied a few fish and some bread into enough food to feed a small army, and now the crowd who had stuffed themselves were after more food. They wanted another free lunch. Jesus wanted to give them much more. Food to nourish their souls and renew their spirits. We are fast approaching Good Friday. The evening before the crucifixion Jesus gathered with his dozen disciples to eat the Passover meal. It is at this dinner that we can better understand what Jesus was talking about – all that eating flesh and drinking blood stuff. Jesus takes some bread and breaks it and tells the twelve that the bread represents his body, his flesh, and they are to take and eat. He lifts a cup of wine and instructs his followers that the wine is his blood, the blood of a New Covenant, and they are all to drink it. Two thousand years later we are still eating his flesh and drinking his blood, remembering his crucifixion and celebrating his resurrection. Living abundant, joyful, happy lives as a result. I guess his words weren’t so crazy after all. celebrating Mexican Independence Day last year. procedure revealed a large tumor in her stomach. variety of tests followed to diagnose the severity of the cancer. Initially it seemed the cancer was confined to the tumor and surgery was scheduled on a Sunday. She was admitted to the hospital the day before. Medicine and doctors and hospitals are an interesting thing in Mexico. At least interesting to me, having spent most of my life in the United States. I haven’t got it all figured out, but it seems to me that there are three levels of health care in this country; one level for people who have some money and can afford private care. Another level for people who have money taken out of their wages to pay for health insurance and are treated by public doctors and nurses in public hospitals which is free. The last level is for poor people who don’t pay for health insurance. If they have a medical need they go to the local public health clinic and are usually treated for free for basic simple health problems, but if it is serious they have to go to a public hospital and pay cash or they don’t receive treatment. Public medical services are not terrible. I have two daughters who were born in a public hospital with public doctors and nurses, with no ill effects, and it was all free, because my Mexican wife has money taken out of her wages to pay for health insurance. A couple of problems with public health care here are long waits to see a health care professional and most of the doctors and nurses are fresh out of medical school and don’t have a lot of hands on experience. Also, in public hospitals you have to share a room with two or three other patients, and family members can’t stay with the patient for the whole time, which is important in Mexico. Family comes first in Mexico, and if one family member has to go to the hospital, at least one other member of the family moves in with them, at private hospitals that is. If it is public hospital, family members stay and sleep in the waiting room or outside the hospital. Madre stayed at a private hospital, even though the family is poor. We thank God for GoFundMe and all the people who generously donated money and allowed Madre to receive wonderful care at a beautiful little hospital in Oaxaca. All the rooms had a large couch for family members to sit on during the day and sleep on at night. My wife slept on one during her mom’s hospital stay which was six days. Sometimes Madre’s mother, husband, son and family friends were all there at once! It wasn’t as bad as it may seem because this was the most unique hospital I have ever seen. It only had eight rooms and used to be like a convent or little monestary operated by a Catholic organizations about a 100 years ago. Then it went into the hands of St. Vincent DePaul Society run by a guy named Vasconcelos, and now it is Vasconcelos hospital. It has a chapel called Sacred Heart which is open to the public on special occasions. In the middle of this hospital is a courtyard with potted bougainvilleas and patio furniture all around for family and friends to take advantage of. The first couple weeks after the surgery was difficult, because of physical and emotional reasons. Physically she vomited what little food she was able to swallow and became dehydrated and had to go to the emergency room. Emotionally it was a difficult time because the tumor and samples of her stomach tissue that was taken out of her went to a lab and it was discovered that the cancer had spread. She found out she has stage three cancer and the prognosis isn’t that great. Chemotherapy is in her near future. Now she is doing much better, both physically and emotionally and spiritually. She is eating a lot more and keeps it all down. Emotionally she is happier. Spiritually she has always been strong. She doesn’t understand why she has had to go through all this, none of us do. But she fully trusts in the Lord who has given her the peace that surpasses all understanding that Paul writes about in Philippians 4:7. I have been thinking about Psalm 23 a lot lately, especially the “valley of the shadow of death” part. I think we all love the opening verses that speak of green pastures, quiet waters and refreshing souls. The “shadow of death”, not so much. But I have come to realize that for the sheep to enjoy those rich, green pastures and cool, quiet waters, they sometimes have to travel through the valley of the shadow of death. The Good Shepherd knows best. He knows where the nutritious food and refreshing drink is, and his sheep know his voice and confidently follow him into and through the scary, dark valley, to green pastures and still waters. They trust him because he is wise and strong. They have no fear because He is with them, and he wields a stout rod and sturdy staff. That’s the faith of Madre. As she journeys through the dark valley, she fears no evil but trusts in her good, good Shepherd; her good, good Father. No one knows what she will encounter on the other side of the valley. Maybe many happy, healthy years on planet earth, or maybe eternity in heaven with the Lord. Whatever happens it’s all good. She doesn’t know what the future holds, but she knows WHO holds the future. Today is Ash Wednesday. The one day of the year when many Christians all over the world will have ashes put on their foreheads in the shape of the cross. This marks the beginning of Lent, a time of waiting in expectation of Easter- Resurrection Sunday. A time of contemplation and inner examination. A time of anticipation and adoration. A time of waiting. When we wait, we choose. Sometimes we choose to grumble and complain. Sometimes we choose to get frustrated or worried. At times we choose to rejoice and give thanks. Many times our choice depends on what we are waiting for. More often than not, it depends on the kind of person we are. Ultimately we wait patiently or impatiently. It all depends on what’s inside us. I have read an article and a book recently that have greatly impacted my perspective on patience and what it means to be a patient person. The article is called Silence, Patience and Presence. It is from Fuller Studio. The book is called Liturgy of the Ordinary by Tish Warren. Below are some quotes from both that I hope will impact you as much as they did me. Ones willingness to be wronged, to absorb evil patiently without retaliating, helps to break the cycle of vengeance and opens up the possibility for healing and peace. Hence though forgiveness is a constitutive practice of peace, forgiveness is unimaginable apart from patience. Philip Kenneson. When we practice the Sabbath, we not only look back to God’s rest after his work of creation but we look forward to the rest ahead, to the Sabbath to come when God will finish his work of re-creation. We recall together that we are waiting for the end of the story, for all things to be made new. In the liturgical year there is never celebration without preparation. First we wait, we mourn, we ache, we repent. We aren’t ready to celebrate until we acknowledge, over time through ritual and worship, that we and this world are not yet right and whole. Before Easter, we have Lent. Before Christmas, we have Advent. We fast. Then we feast. We prepare. We practice waiting. We want happiness now. Fulfillment and gratification now. I get angry when I have to wait because it reminds me that time is not at my bidding. Time is a gift from God, a means of worship. Time revolves around God – what he has done, what he is doing, and what he will do. We live in a waiting world, a world where time itself, along with all of creation, groans in childbirth, waiting for something to be born. We are waiting and hoping. Our present reality is fundamentally oriented toward what is to come. Waiting is an act of faith that is oriented toward the future. Yet our assurance of hope is rooted in the past, in the person of Jesus of Nazareth and in his promises and resurrection. In this way, waiting, like time itself, centers on Christ-the fulcrum of time. Scripture tells us that when we “Hope for what we do not see, we wait for it with patience” (Rom 8:25). We live each ordinary day in the light of a future reality. Our best life is still yet to come. I have a friend who has struggled with cancer for a long time. She said to me one day,”I always felt like I was waiting for the gift. But I have come to see that the waiting is the gift.” There is more happening while we wait than just waiting. God is at work in us and through us as we wait. Our waiting is active and purposeful. The singular mark of patience is not endurance or fortitude, but hope. To be impatient is to live without hope. Patience is grounded in the Resurrection. It is life oriented toward a future that is God’s doing , and its sign is longing, not so much to be released from the ills of the present, but in anticipation of the good to come. Even now as we wait, God is bringing the kingdom that will one day be fully known. We can be patient because we know there are gifts promised by a Giver who can be trusted. May your Lent be filled with peace, the presence of God, and patience. Valentines Day is coming up. The day of love and romance. A day where people will celebrate love – love for spouses and boyfriends and girlfriends. They will celebrate with things they love, like roses, candy and wine. At least in the United States. Here in Mexico it is also know as dia de amistad, day of friendship. People will not only do something with a romantic interest, but friends will take time out to express their love for each other in special ways. It’s too bad English only has the one word “love”. We love our spouses or romantic partners. We love chocolates and flowers. We love our friends. We love our mother. Other languages have different words for different kinds of likes and attractions. The Bible uses that English word “love” many times, but in it’s original languages of Hebrew and Greek, it has different words to express different types of love. One main word the Old Testament uses for love is “hesed” or “chesed”. The word Hesed or Chesed/Cheset is connected with love, goodness and kindness but means more, a bit like the English word “charity” “mercy” or “grace”. Greek uses words like “eros”, “storge”, “philea” and “agape”. Eros refers to “passionate love” or romantic love; storge or familial love; philia to friendship as a kind of love; and agape refers to “selfless love“, the kind of love God has for us and wants us to have for one another and for him. Agape love is more about Devotion to God and to our fellow human beings. The other loves are more about emotional attachments or attractions. soul and with all your mind. Love your neighbor as yourself. Love is devotion to God and neighbor. “I was hungry and you gave me something to eat. I was thirsty and you gave me something to drink. I was a stranger and you invited me in. I needed clothes and you clothed me. I was sick and you looked after me. “Lord, when did we see you hungry and feed you? When did we see you thirsty and give you something to drink? When did we see you a stranger and invite you in? When did you need clothes and we clothed you? Lots of devotion and commitment to helping others. Not so much emotion. Love does not boast, it is not proud. We can see the devotion and a little emotion. Dear friends, let us love one another, for love comes from God. act as if you did. As soon as we do this we find one of the great secrets. Maybe, in the end, it is all about emotion. Perhaps, when we are devoted to doing God’s will and helping those around us, we will be happier people. It could be that God loves us and wants us to be happy, and the road to emotional happiness and well being, goes through Devotion. This Valentines Day, lets try some Devotion, some good old fashioned Agape Devotion, and see what kind of emotions we have at the end of the day. Next week, Foundation For His Ministry’s Home For Needy Children in Oaxaca, Mexico, will celebrate twenty years of existence. Twenty years of helping the poorest of the poor. Two decades of making disciples, of meeting the physical, emotional and educational needs of children who have been abandoned, abused and neglected. Casa Hogar (as it is called in Spanish) has been following God’s call and God’s example of making beauty, sharing truth and doing good. Twenty years ago this 14 acre plot of land in the Tlacolula Valley was nothing but a half finished building and a lot of big thorn bushes. Now it is a place of beauty, with many gardens and wonderful architecture. Twenty years ago leaders of Foundation For His Ministry began sharing truth with people of the region. The indigenous people like the Zapotecs, Mixes, Mixtecs, as well as native Mexicans heard the Good News that God loves them and wants them to be happy; that Jesus is the Way, the Truth and the Life; that through Jesus they can have peace with God and live an abundant, eternal life. Oaxacans from pre-school age to old age heard the truth about life and death; good and bad; heaven and hell. Pastors and missionaries went into area prisons and remote mountain villages preaching hope, restoration and renewal to those who felt hopeless, helpless and lost. Children from the Home learned and continue to be taught the truth of God and his Word in morning devotions, Sunday School, church services and youth conferences. They learn the truth of God’s World in our primary school called Oasis. They also hear and apply truths at special events like swim camps and at mountain retreats. Twenty years ago, missionaries from FFHM came to Oaxaca with a vision of doing good. A vision of feeding the hungry, clothing the naked, healing the sick and taking in the stranger. For two decades servants of Christ have been cooperating with God, FFHM, local and regional authorities to make a difference in the Kingdom of God and Oaxaca’s seven regions. Doing good by meeting felt needs, and more importantly, meeting the deep spiritual needs of people in southern Mexico who are walking in darkness. FFHM has been bringing the Light of Life to thousands of lost souls for these last twenty years, and, God willing, for the next 20 years and more. not according to our wickedness and iniquity. to a happy and blessed end. we may joyfully give you exceeding thanks. Pardon our sins and mutual offenses. and whatsoever is able to injure charity and diminish brotherly love. and go forward to the life eternal. In high school and college I went to freshman orientations. These were intended to help new students orient themselves with the geography of the school. I learned where the library, cafeteria and different classrooms were. After orientation I always knew where these places were, no matter where I was. That was important. To this day I have bad dreams that I am in some large school and I am disoriented and can’t find my class, or worse yet, the bathroom, and I really need to go! Orientation is important for everyone. Orientation is not just knowing where we are spatially, but also knowing where we are mentally, emotionally and spiritually. Many people’s lives are oriented around the wrong things. For example, some people orient their lives around money and the accumulation of wealth. Acquiring wealth makes them happy, at least for awhile. With money they have a house, a car, a savings account. They can have nice clothes and eat at the best restaurants. With wealth they have security and status. They know where they are by how much money they have. May I suggest that we choose to orient our lives around Jesus? I recently read about a comedian whose life was oriented around being a comic. He couldn’t imagine his life oriented around anything else. Then he heard about Jesus, and how he would live a happier, more complete, more contented life, if his life was oriented around this God/Man. He didn’t believe it. He fought against it. But he couldn’t get Him out of his mind. Finally he gave in. In his words, he began to orient his life around God, and discovered, quite to his surprise, he was happier, more complete and more content. I like that he used the word “orient”. Some Christians use the words Saved, Born Again, Converted, Redeemed or Rescued. Those words indicate important aspects of what it means to be a God Follower, but not the entire package. I think the the concept behind the phrase “to orient myself around God” encapsulates the entirety of what it means to be a Christian. When I orient myself to God, my whole life, every moment becomes related to God who loves me and gave himself for me. My life is oriented around God at a mission that helps needy children in Oaxaca, Mexico; a mission run by FFHM. Our mission statement states that we exist to make disciples of Christ. A disciple is one whose life is oriented around the teachings and practices of a person or organization. We aim to orient the poorest of the poor in Mexico to lives centered on Jesus. This ministry takes in children whose lives have been oriented around abuse and poverty, neglect and rejection. Showing them the love of God by meeting their physical, mental, emotional and spiritual needs enables them to reorient themselves toward a better life. Once they see themselves as dearly loved children of God and orient their lives around that truth, they are able to live happy, fulfilled lives. We all want to be happy. God created us in his image; he created us to be happy. We can all be incredibly happy. It just takes the right orientation. Thinking of Christmas? Think of Death. Thinking of Christmas? Think of death. That’s what the angel of the Lord was thinking of when he told Joseph to name Mary’s son Jesus, for he would save his people from their sins. (Mt. 1:21) It was Jesus death on the cross that accomplished salvation from sin. Thinking of Christmas? Think of death. This Christmas maybe we can change our focus a bit. Sure there are gifts, decorations and family gatherings to consider, but perhaps these last few days before December 25th, we can orient our thoughts toward something more substantial, like death – the true reason for the season. Let’s fix our eyes on Jesus, who for the joy set before him, endured the cross. Jesus was born to die so that we can live. Let’s embrace death to self so that we can live meaningful lives in Christ. God became flesh and dwelt among us and died for us because he loves us and wants us to be happy. Thinking of Christmas? Think of death, and celebrate! I read an insightful article from Fuller Studio entitled Silence, Patience and Presence. 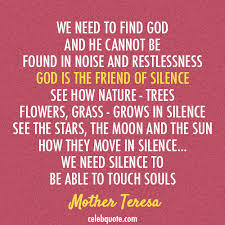 I especially liked what the author, Dr. David Augsburger, had to say about Silence, and want to share some with you. He begins the article recounting an experience when he was a young pastor and went to be with a man whose wife had just died. They went for a long walk in the rain. Neither man talked. When they got back to the house, the man told the pastor to go home. On the way home, the pastor, the author of the article, felt ashamed, an utter failure, because he had not give the man any advice or words of comfort. Later he realized that silent presence was probably the best pastoral care that he could have given. 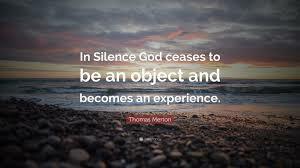 He follows with some wonderful quotes about silence. Silence is the gift we give when words are untrustworthy, unnecessary, unwise. only the one who has learned to be silent is prepared to speak. Silence is the language of respect. seven days of silence waiting for the sufferer to speak first. One who loves God loves silence also. One who loves Christ loves the silence of the desert. One who knows the Spirit knows the winds of silence. If we root our lives in silence we grow deep into God. I have been thinking a lot about the importance of silence after reading this article. I wonder if I spend enough time in silent reflection of God and his will; of Christ and his sacrifice; of the Holy Spirit and what he is saying to me. I am concerned that maybe I speak useless words without thinking that may offend or hurt a brother or sister. Perhaps I need more time alone to consider the deep things of the Father and the Word and listen to his still, small voice. I will go off by myself to a quiet place and give it a think. God wants his chosen people to live in community and respect and care for one another, especially those who are poor and powerless and most likely to either be forgotten or taken advantage of. That would be the foreigners, fatherless and widows. God takes special pains to remind the Jews that they were once foreigners in Egypt and to remember how unpleasant that was – to be used and abused. It was bad, don’t treat the foreigners in your midst like that. With regards to the fatherless and widows – well, in that patriarchal society the male head of household was everything. The breadwinner. The family representative. The protector. If the father died the outlook was pretty bleak for the surviving spouse and her young children. Relatives were expected to help them out. But God goes beyond leaving the burden of care to the extended family. He wants all the people of the community to not only help them out, but to respect them, remember them and include them. Perhaps people who fail to look after orphans (the fatherless) and widows have already been polluted by the world. In the United States there are more fatherless and single mothers than ever before. Doing some research on the internet I was surprised to learn that there are aproximately 13 million single mothers raising 22 million children and that about 60% of children living in mother only families are impoverished while only 11% of children living with two parent families are impoverished. In the Gospels children seem to have a special place in Jesus heart. I don’t think that has changed, and perhaps none are closer to him than the fatherless. The department of Housing and Urban Development reports that there are about 554,000 homeless people in the United States. There are about 16.1 million mentally disabled people in the United States. 5.5 million veterans have some type of disability. Thank God for all the churches and various ministries who help these millions of people with encouragement, programs and spiritual direction. Everyones greatest need is the love of God and living in right relationship with God. God loves everyone and wants everyone to be happy. Sometimes God calls a church or individual to be part of the answer to relieve human misery; to bring joy and peace to a suffering soul, whether that person be a foreigner, a fatherless boy or girl, a single mother, a bruised and battered veteran, a homeless person or a mentally challenged individual. Helping people in need helps us to be happier people. Just ask God, he’ll tell you. I have been reading Deuteronomy lately. Three times in chapter 12 the Israelites are instructed to rejoice. Two of these instances hearken back to my last post. Moses relays God’s instructions to the people that when they take control of the Promised Land they are to gather in a place that God will designate and offer sacrifices and offerings and rejoice. They are to celebrate God and his rich blessings that he had given them. Moses told the people to rejoice in everything they put their hands to, and Paul tells people in the church emphatically to rejoice in the Lord always. After meditating on these words I decided, at least for one day, to be intentional about rejoicing in the Lord. I get up pretty early most mornings, and when I went outside to begin my workday, it was still dark, and the sky was filled with stars. I rejoiced in this beautiful sight and gave thanks to God for his marvelous creation. All those stars! God didn’t have to make all those stars, but he did because he loves us and wants us to be happy. He wants us to rejoice, to feel great joy and delight. I’m the gardener at the home for needy children here in Oaxaca, Mexico. One of my jobs is to water the soccer field. I turned on the sprinkler and rejoiced that we have water that keeps the field green and the kids have a wonderful place to play their favorite sport. My wife, Anita, is the kitchen supervisor and was making breakfast that morning. Walking into the kitchen I rejoiced in the dedicated wife that God has given me, and that we could work together in ministry. Helping her make quesadillas I rejoiced that the children and staff would have a healthy, nutritious meal to start their day. I thought of Jesus words, ” I was hungry and you gave me something to eat…When you have done it to the least of these, you have done it to me.” I wondered what the children would have had for breakfast, if anything, if it wasn’t for this home for needy children. Afterwards I drove some of the teenage girls to their school in Oaxaca city. I rejoiced that they could go to a private Christian school and get a quality education that would prepare them for whatever career they might choose. I rejoiced that God chose me to be a part of their lives, to make a difference in who they are and what they would become. And so went the day, rejoicing intentionally in the Lord and all that I put my hands to. I realized that no matter what we do, we have three choices in how we emotionally react. We can complain about what we see wrong or negative in our situations. That makes us angry or depressed. We can react indifferently which makes us apathetic. Or we can rejoice, which makes us alive to God’s presence and his blessings. This makes us happy, and after all, God does love us and wants us to be happy. Most of the day the rejoicing thing went great because all my situations were pleasant ones. That changed toward the end of my day. After work I took my daughters, Sally and Kelly, to their piano class. While they learn tunes on the keyboard, I teach the piano teachers daughter English. It’s a barter deal where no money exchanges hands and everyone is happy. I rejoiced that my girls enjoy learning the piano and I could bless the music teacher and her daughter with English skills. When we finished we went to a little piece of property that Anita’s dad had given us. We are in the process of building a tiny house and have planted a few fruit trees that needed to be watered. I rejoiced at the thought of these blessings as well. What we encountered upon reaching the property was not a blessing. Some mischievous young truant, or so I guess, had crawled under our fence, had climbed to the top of a shed where we keep a water tank, and had broken off the water valve, unleashing a thousand liters of water. How could I rejoice now? I told them that this is how a lot of people act in the “real” world. I explained to them that they live in a Christian community and go to a Christian school, and while Christians aren’t perfect, they normally try to live by the standard of love, and that is what they are used to. People in the world who are not Christians, many times just live by the moment and if it makes them happy to cause pain to others and destroy things, they just do it. After saying these words I found cause to rejoice. I told the girls that we needed to pray. So we prayed and rejoiced at the work God had done in our lives and was continuing to do. We thanked God that nothing worse had happened and prayed for the person who had done this, that he might see the light and come to know the love of God and find his joy in Jesus and not in random acts of violence. We got back in the car and drove home. Most of the anger and frustration had left me, replaced by the “peace that passes all understanding.” Some disappointment remained, but it helped me to think of Paul’s words to the Roman church, “All things work together for good to those who love God and are called according to his purpose” (Romans 8:28). And in this I rejoiced.